During orbits 423 through 424 on 22 September 1990, Magellan imaged this impact crater that is located at latitude 10.7 degrees north and longitude 340.7 degrees east. 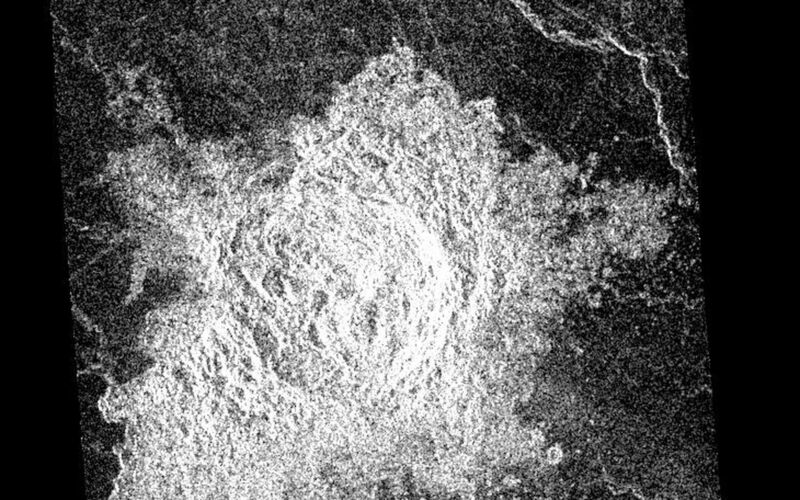 This crater is shown as a representative of Venusian craters that are of the proper diameter (about 15 kilometers) to be 'transitional' in their morphology between 'complex' and irregular' craters. 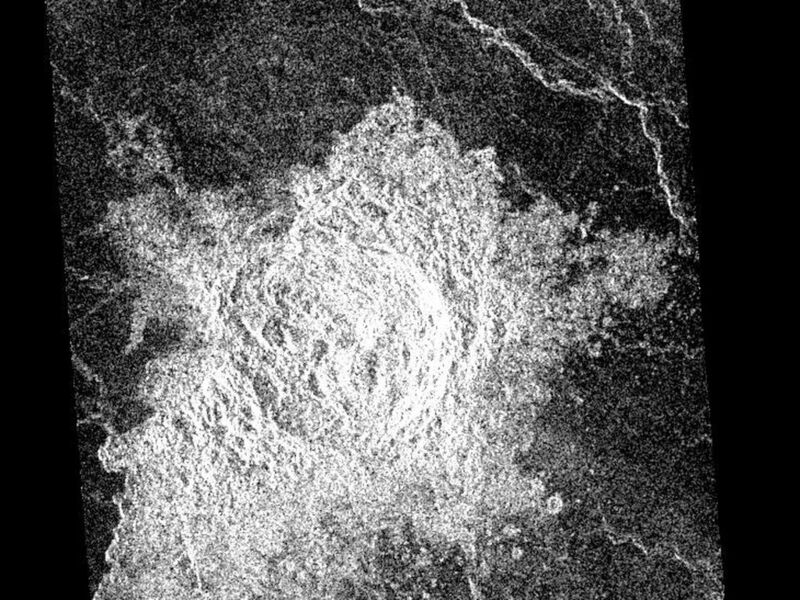 Complex craters account for about 96 percent of all craters on Venus with diameters larger than about 15 kilometers; they are thought to have been formed by the impact of a large, more or less intact, mass of asteroidal material that has not been excessively effected during its passage through the dense Venusian atmosphere. Complex craters are characterized by circular rims, terraced inner wall slopes, well developed ejecta deposits, and flat floors with a central peak or peak ring. Irregular craters make up about 60 percent of the craters with diameters less than about 15 kilometers. Irregular craters are thought to form as the result of the impact of asteroidal projectiles that have been aerodynamically crushed and fragmented during their passage through the atmosphere. Irregular craters are characterized by irregular and/or discontinuous rims and hummocky or multiple floors. The 'transitional' crater shown here has a somewhat circular rim like larger complex craters, but has the hummocky floor and asymmetric ejecta characteristic of smaller irregular craters. Observations of the total solar irradiance made with the ACRIM3 instrument on NASA's ACRIMSAT satellite on June 5 and 6, 2012, tracked the effect of the transit of Venus, which lasted about six hours. 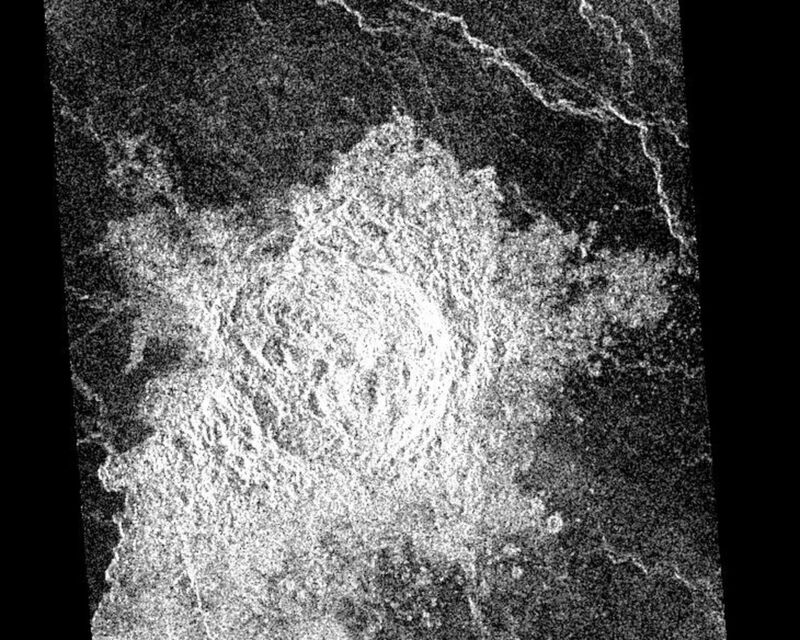 This figure shows the volcanic peak Idunn Mons in the Imdr Regio area of Venus. 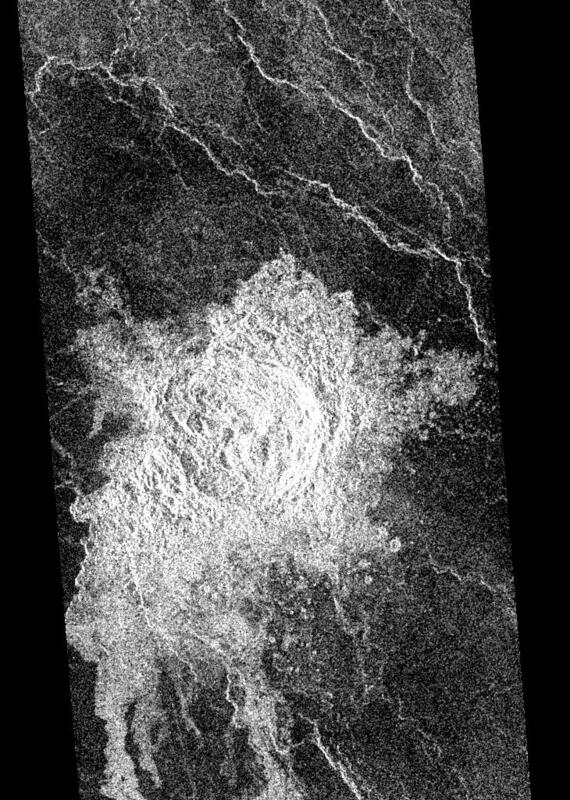 The topographic backbone (brown color) was derived from data obtained by NASA's Magellan spacecraft and the overlay was derived from data from ESA's Venus Express Spacecraft. NASA's Mariner 2 was the world's first successful interplanetary spacecraft. Launched August 27, 1962, on an Atlas-Agena rocket, Mariner 2 passed within about 34,000 kilometers (21,000 miles) of Venus.